The fair can be expensive but you can still do and see some really wonderful things for free or cheap. I love the DNR building. I can spend a good bit of time watching all the fish in the pond and in the new indoor fish exhibit. I hear there is a huge sturgeon in there this year. You can also get a free lake map from the DNR. In the past, they have had someone outside at a little store selling fishing licenses but they will also give you a copy of a lake map if you know the name of the lake and the county it is in. Yes, there are 30 Long Lakes in Minnesota. Head over to the Eco Experience building, they have many free demonstrations each day. I am interested in many of the topics such as vertical gardening, rain barrels, eco fashion, straw bale gardening, healthy local foods cooking demonstrations, and chickens in the city. I mean where else can you learn how to become an urban chicken farmer? You can look at the full schedule at the Eco Experience HERE. Minnesota Public Radio broadcasts from the fair and many times they have performances from musical artists that are performing later that night. P.O.S. will be at the MPR booth on August 29th at 4PM and the pre-show music-on-a-stick is from 3-5PM on August 30th. See the full schedule at the MPR booth HERE. There is free entertainment on many different stages at all times of the day. I think this is one of the best benefits of coming to the Fair. Hanson– Known for their hit from the 90’s MMMBop, they are making a come back. August 26-27 at 8:30PM. Jared Sherlock– Great for families, Jared is a magician who will surprise and amaze you. September 1-2 at 10:30AM , 11:30AM , and 3:00PM. The Okee Dokee Brothers– Great for families, these Grammy award winners are fun and know how to get your children dancing. August 24-25 at 10:30AM , 11:30AM , and 3:00PM. Always do the free park and ride or bike to the fair. It is way less hassle then trying to park at the fair. If you volunteer at the fair usually you get in for free. If you have some extra time and know of a place where you want to volunteer, it is a great way to do something good and get in free. You can listen to people sing “Call Me Maybe” at The Giant Sing Along for free or even sing along yourself. If you are into that kind of thing. Not sure where this is at the fair, but the Boy Scouts have a climbing area for kids and it is free. It is free to walk through the Fine Arts building. You will get to see art from local artists and the building is air conditioned. If you are looking for free swag, don’t miss the Education Building where most of the colleges give away something such as the purple St. Thomas bag. All of the news stations and construction type companies give away stuff at certain times during the day. Stop by early on to see when you get in line for free stuff. KARE 11 is giving away blue sun glasses, Home Depot usually does make it and take it crafts, and Menards has nail aprons. I also suspect the health fair will be giving away pretty neat stuff this year since MNSure is launching and Healthcare Reform is underway. Gopher State One Call is giving away free bright colored yardsticks if you promise that you will call before you dig. They are located across from the Giant Slide. Give it to your favorite teacher as a beginning of the school year gift. You can see a list of all the free items on this deal list HERE. Get an Apple Cider Freeze in the Ag/Hort building, they are only $1 and made from cider from the Pine Tree Apple Orchard in White Bear Lake. Also in the Ag/Hort building you can get a Honey Stick from Mademoiselle Miel for only 50 cents. They have a smoked scotch version that I have to try. Plus, the money goes to benefit the University of Minnesota Bee Lab. All you can drink milk for $1 is always a favorite of mine. I can taste the freshness of the milk and it actually is quite refreshing. 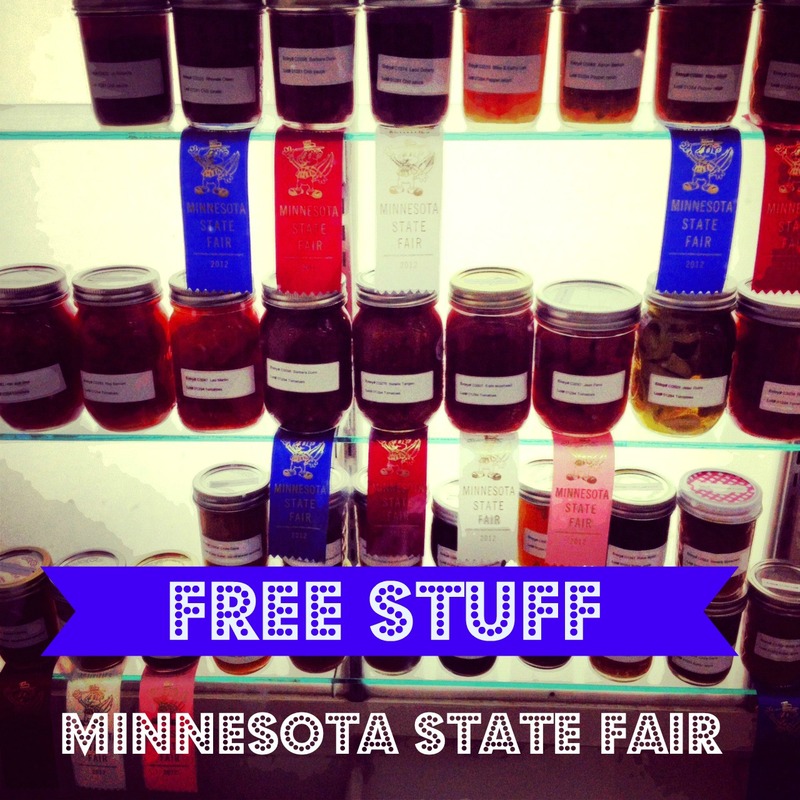 What is your favorite free thing to do at the fair? I’m so bummed Hanson will only be around on the week days! I would have paid to see them, if it had been on a weekend! I really like the baby animal building. I’m not a fan of animals so its nice to see them when they’re at their cutest! I have a feeling that Hanson concert will be packed. I love the Miracle of Birth building especially now that it is revamped. It is really cute to see kids get excited about seeing animals. Let me know if you make it to the fair!